Math fluency through screen-free games! Why was six afraid of seven? Because 7 ate 9 of course! You may have heard that one, BUT do you know WHY 7 ate 9? Because it needed three square meals a day! For parents, what could be better than seeing your child play, laugh & frolic? How about if that play helped reading, writing and math fluency? How about if that play led to more efficient thinking and learning? How about if that play enhanced their self-confidence, self-esteem, self-worth, perseverance, grit, as well as help them to build, strengthen & develop cooperation, life, negotiation, conflict resolution, and leadership skills in a high energy, positive, safe, nurturing environment. That'd be better right? That is exactly what our Sharp As A Tack & 7 Ate 9 programs are all about! 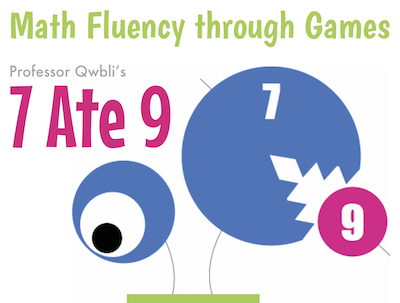 Our 7 Ate 9 program differs from our Sharp As A Tack program, only in that we exclusively use games that have mathematical implications. While playing and having a blast with their peers, our Contributing Teachers have put together an amazing collection of games to boost your students' math fluency. From the basic math operations, to mental math, to geometry, to logic and reasoning, our 7 Ate 9 program will get your child excited about math without even knowing it!